He liked it so much he stayed. 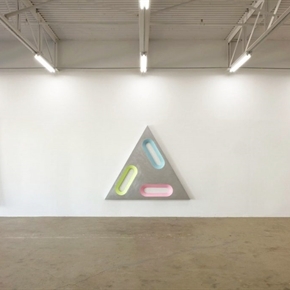 After a series of successful years as a dealer at the Dallas Art Fair, Frank Elbaz — owner of Galerie Frank Elbaz in Paris, which is also a regular exhibitor at Art Basel, The Armory Show, Frieze New York, and Art Basel Miami Beach — unveiled a second location in Dallas. Since its debut last September, the Glass Street transatlantic transplant has presented three exhibitions in a power spot neighboring Photographs Do Not Bend and across from Dallas Contemporary. The lineup included a group show introducing French and American talents in the stable, followed by solos for mid-career American Blair Thurman (geometric sculpture influenced by car culture) and Houston’s enfant terrible painter Mark Flood (fresh from his Contemporary Arts Museum Houston retrospective). All opened to critical acclaim. His current show, “Meandering, Abstractly” (through March 25), makes one thing clear: Galerie Frank Elbaz isn’t going anywhere. “To establish a gallery with a stable of important post-war French and American conceptual artists in a cultural center like Dallas that continues to grow is far more exciting than the established centers of New York or Los Angeles,” Elbaz says. Dallas gallery director Elizabeth James circuitously ended up back in Dallas after graduating from TCU, then decamping to Los Angeles for plum posts at Margo Leavin Gallery and Cherry and Martin. She was lured back to Texas to oversee the gallery’s Dallas programming, which we hope will include showcasing works by seminal California artists Jay DeFeo and Wallace Berman (both featured in a Beat generation show at The Menil Collection in Houston, through March 12, and among the estates Elbaz represents). The scene during the VIP opening for “Meandering, Abstractly” was a Who’s Who of the art contingent. Curated by Paul Galvez, a research fellow at the Edith O’Donnell Institute of Art History at UT Dallas, the exhibition thoughtfully explores post-war European abstraction by way of politically charged works.